On Tuesday we gave you the ratings for the June 22 Sunday Shows in the DC Market. 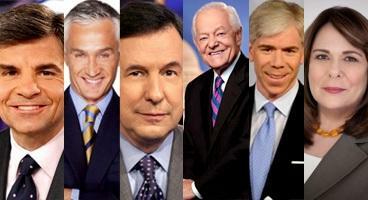 TVNewser has the national ratings. CBS’s “Face the Nation” : Sen. Joe Manchin (D-WV), Armed Services Committee; Sen. John Barrasso (R-WY), Foreign Relations Committee; James Jeffrey, former U.S. Ambassador to Iraq; Margaret Brennan, CBS News State Department correspondent; TIME’s Michael Crowley; WSJ’s Peggy Noonan; WaPo’s Michael Gerson; former White House press secretary Dee Dee Myers; author Todd Purdum. “Fox News Sunday”: General Michael Hayden; Rep. Bob Goodlatte (R-VA); Rep. Xavier Becerra (D-CA); Albert Small, philanthropist and collector; Brit Hume, Fox News senior political analyst; AP’s Julie Pace; Karl Rove, former White House senior advisor, Fox News contributor; Kirsten Powers, USA Today / Fox News contributor. NBC’s “Meet the Press” : Taped interview with former President Bill Clinton. More TBA. ABC’s “This Week” : President Barack Obama ; Rep. Peter King (R-NY); ABC’s Donna Brazile; ABC’s Matthew Dowd; Bill Kristol, editor, The Weekly Standard; Katrina vanden Heuvel, editor and publisher, The Nation; ABC’s Terry Moran; Slate’s Dahlia Lithwick; Carrie Severino of the Judicial Crisis Network and National Review Online. CNN’s “State of the Union“ : Rep. Darrell Issa (R-CA); chairman, Oversight and Government Reform Committee; Rep. Mike Rogers (R-MI); chairman, House Intelligence Committee; William Taylor III, attorney for Lois Lerner; CNN’s Stephanie Cutter; Mattie Duppler, director, Budget and Regulatory Policy at Americans for Tax Reforms; Liz Mair, Republican strategist; Neera Tanden, president & CEO, Center for American Progress. CNN’s “Inside Politics” : Amy Walter, national editor, The Cook Political Report; NPR’s Steve Inskeep; WaPo national political reporter Robert Costa; NPR education blogger Juana Summers. CNN’s “Fareed Zakaria GPS” : Henry Paulson, former U.S. Treasury Secretary (George W. Bush Administration); Robert Rubin, former U.S. Treasury Secretary (Bill Clinton Administration); John E. McLaughlin, former Deputy Director for intelligence of the CIA; Walter Russell Mead, Editor-at-Large, The American Interest; Geoffrey Wawro, author, Quicksand: America’s Pursuit of Power in the Middle East. CNN’s “Reliable Sources” : Dan Rather, former news anchor, CBS Evening News; Philip Mudd, former CIA Deputy Counter Terrorism Director; Lt. Col. Rick Francona, CNN commentator; Middle East expert. 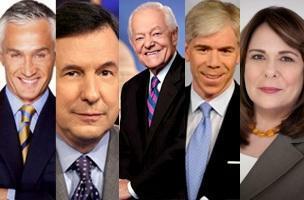 PBS’s “Washington Week” : Reuters’ Joan Biskupic; NBC News’ Pete Williams; WaPo’s Dan Balz; ABC News’ Martha Raddatz. C-SPAN’s “Newsmakers” : Sen. John Thune, (R-SD); POLITICO’s Burgess Everett; CQ Roll Call’s Niels Lesniewski.